While much of Nature takes a break during the long months of winter here in the Great North Woods, the fun and activities at Lopstick never stop. You can bring the entire family and celebrate the holidays with us (check out our special Christmas Package here), or book one of our cozy cabins–most have either a gas or a wood-burning stove or fireplace– for a romantic midwinter getaway. But those who enjoy active pursuits will find plenty to do during the winter months. Our town of Pittsburg, New Hampshire, is considered the snowmobiling capital of New England once the snow begins to pile up. There are more than 200 miles of groomed trails through the woods and around the many lakes and ponds in our town. In addition, our trail system links with those in Quebec, Vermont and Maine, and our NH neighbors to the South to provide almost limitless destinations to visit on your snowmobile. It’s how people get around up here. You can ride to restaurants, gas stations, stores, cafes and more. Our trails are maintained by the Pittsburg Ridge Runners, New Hampshire’s largest snowmobiling club. Visitors and daytrippers are always welcomed by this group, and Lopstick can provide riders with the latest trail conditions and itinerary recommendations. Our trail system is usually rideable through early April. All of our 55 cabins are located on or near a snowmobile trail: bring your own machine and park it right outside your cabin. Lopstick offers rentals of late model, four-stroke Ski Doo 600 machines for one or two riders. Your rental comes with an updated trail map that stays in the snowmobile to use. We provide full coverage snowmobile helmets with every snowmobile rental. All snowmobiles need to be back at the lodge by 5:00 pm for all renters. If you have a snowmobile reserved for multiple days you will need to check back every evening by 5:00 pm to have the snowmobile checked. After the inspection is complete you are off to enjoy some night riding again. Take advantage of our winter season Ride and Stay Snowmobile Experience Package rates. Choose from the listed cabins or call us to customize a stay in your favorite cabin. 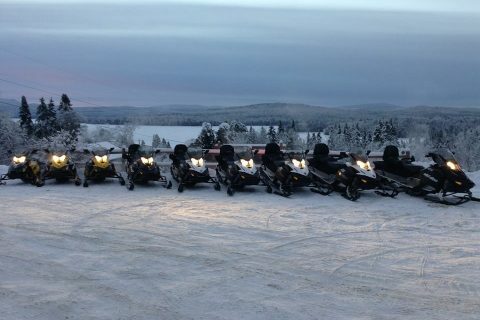 We offer the snowmobile rentals to our guests first. But if you are not staying with us we can reserve a snowmobile for you provided that it’s available. Just give us a call. Here are the prices for our snowmobile rentals. Single snowmobiles for guests who are staying with us are $150.00 for 1/2 day and $230.00 for a full day. Double snowmobiles for guests who are staying with us are $170.00 for 1/2 day and 240.00 for a full day. Single snowmobiles for non guests are $150.00 for a 1/2 day and $240.00 for a full day. Double snowmobiles for non guests are $170.00 for a 1/2 day and $250.00 for a full day. We also offer gear renals as well. Here are the prices of the gear. Complete outfit is $30.00 for a day. We offer helmet rentals to people not renting a snowmobile at $15.00 a day. Your snowmobile rental comes with an updated Ridge Runners trail map that stays in the snowmobile for you to use. We provide full coverage snowmobile helmets with every snowmobile rental. The Connecticut Lakes are home to lake trout, cusk, and brown trout. From our cabins you can conveniently access First Connecticut Lake. 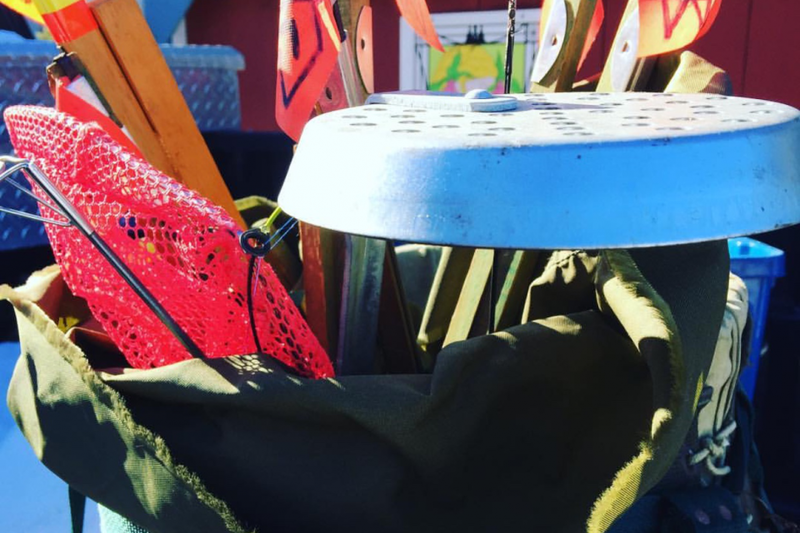 Bait is available at Treats and Treasures which is about a quarter mile to our north on Rte 3. Lake Francis, First Connecticut Lake, Second Connecticut Lake and Third Connecticut Lake are open for ice fishing. Large lake trout are often caught through the ice. 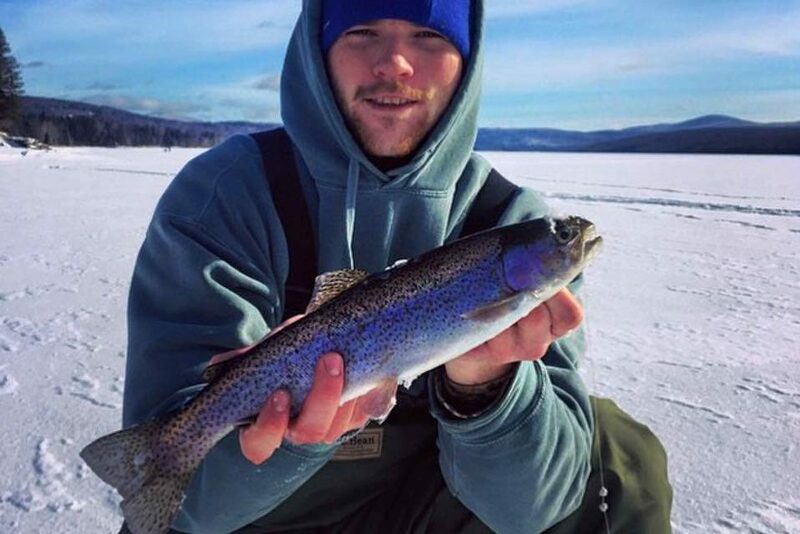 Brown trout are often caught through the ice at Lake Francis. First, Second and Third Lake offer cusk and lake trout. 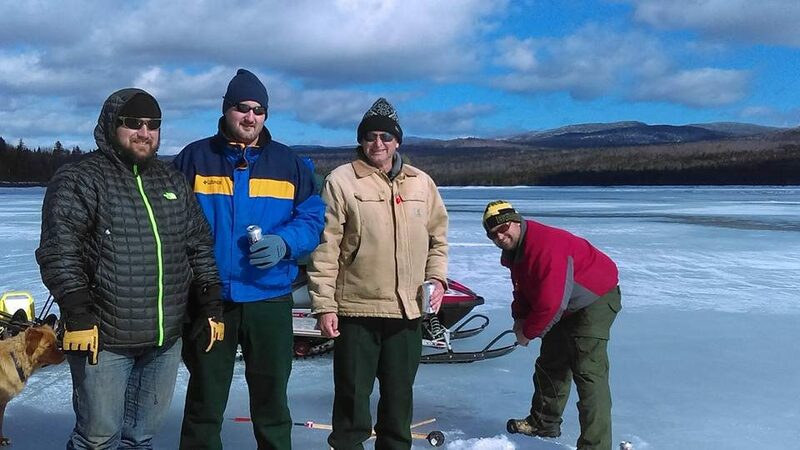 Ice fishing is regulated by the NH Fish and Game Department. For information and regulations, click here.